Keep in mind that these are not all my own creations. I have been gaining inspiration from some other bloggers but I always make sure to give them the credit they deserve! #BlogLove. Also, these are not super fancy smancy as they are just things that my parents wouldn’t make for themselves due to working and such. So take these are ideas for new meals that are generally easy to whip together, healthy and still tasty. 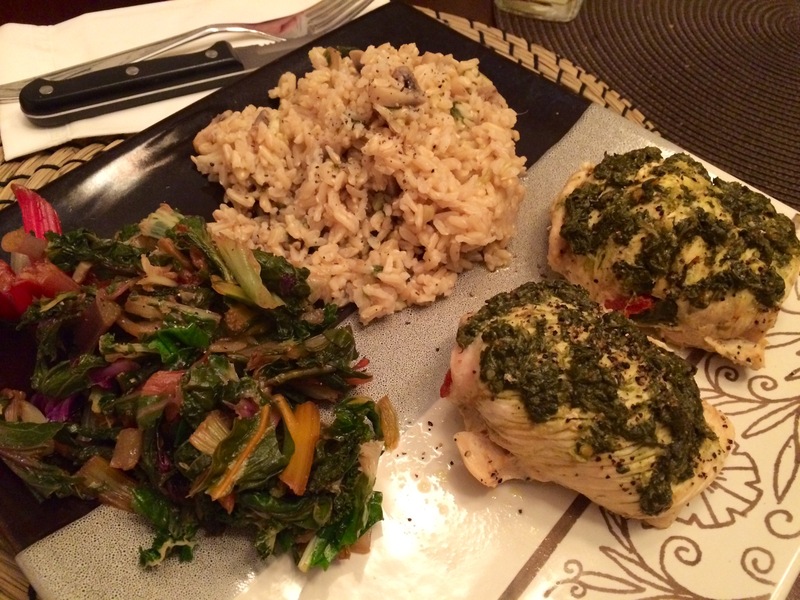 So what did I cook up this week? 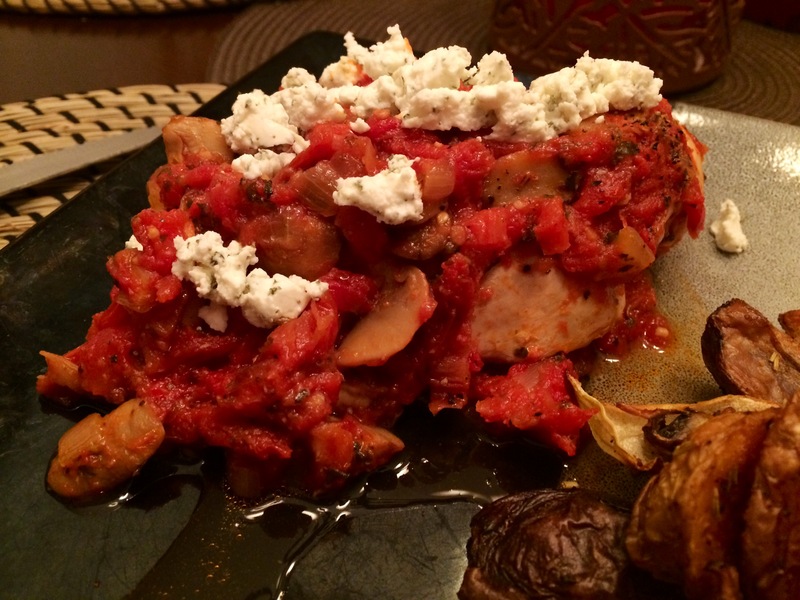 On Sunday evening, which was the first dinner at home, I got inspired by this dish by Paleo Leap as I had in my mind that I wanted to do something like a chicken cacciatore dish. Dad’s plate plus he had an unpictured side salad. I almost stuck to the recipe exactly because the method of cooking it all in one pan on the stove sounded appealing and easy to do while my Mom and I were putting up the tree. The only change that I made was the “tuscan” aspect as I went more with a basil and garlic approach, rather than an oregano one. I served it with roasted multicoloured baby potatoes and vegetables that were simply seasoned with garlic powder, dried rosemary and olive oil. It was all topped off with a lil bit of fine herb goat cheese (the best type of cheese!) and it was done like dinnah. Easy. One pan, few ingredients and some common spices that you have on hand will do the trick. Fast! Once you have browned the chicken, all you have to do is saute the mushrooms, onions and sundried tomatoes for a few minutes, add your tomatoes and seasonings, plop the chicken in there and add the lid and it’s done in like 15 minutes. Goat cheese adds a lot of creaminess and flavour for not a lot of fat. Plus, it’s generally tolerated well by those who are dairy and lactose sensitive like my Mom and I.
I was super excited to make swordfish for my Mom because she had never had it before and I leeeerrrrve it. Unfortunately my Dad has a wee bit of a fish phobia (although he did try a taste! )…he’s missing out on life I swear…so I made him something different which I will get to in a second. I simply baked the swordfish at 350 for about 15 minutes with a lil bit of lemon juice and peppah so that she could really experience the fish. Plus, I generally ain’t about toppings on my fish because I actually crave the taste of the fish and don’t want that flavour to be hidden by a topper. Anyone else feel the same way? 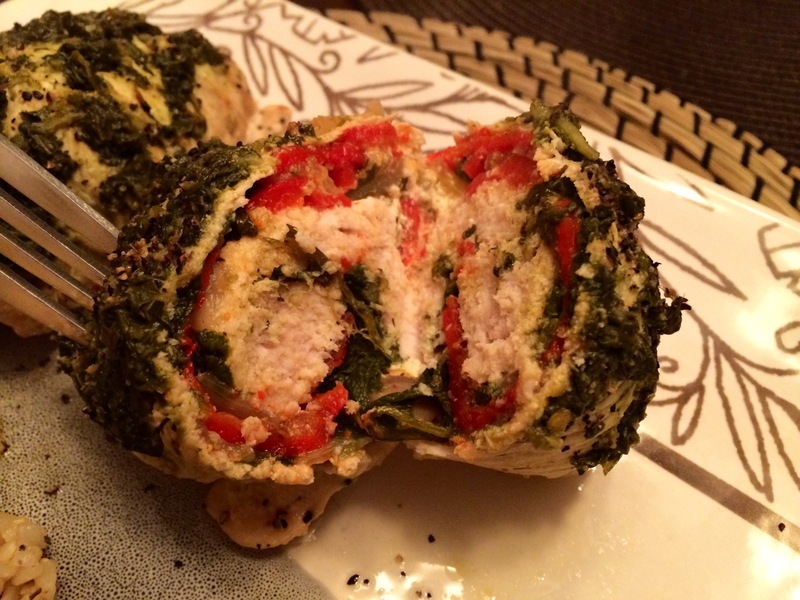 My Dad’s protein was a stuffed turkey scallopini…well two actually because if I had given him one, we would have been looking around for something else to eat. These were really easy and cooked super fast because scallopini’s are really thin pieces. So, I sauteed some mushrooms, garlic, onion and roasted red pepper until the onions were caramelized. I removed it from the heat and stirred in some greens and cracked black pepper and then let it sit to cool a lil bit. Each package of the turkey came with 4 slices, so I just placed the mixture along the entire length of 2 pieces, plopped some chunks of the fine herb goat cheese in random places and placed another turkey scallopini on top. Then all you do is roll them up and place them seam down in a baking dish (with a lid) that has a lil bit of water or stock in the bottom. I topped them with a lil bit of my freshly made pesto (from Monday) and a squirt of lemon juice. Finally, I placed them in the oven at 350 with the lid on until they turkey was cooked, probably about 30 minutes or so. He really enjoyed them. What he didn’t enjoy was me not allowing him to eat until I took not one, but five two takes of his plate. 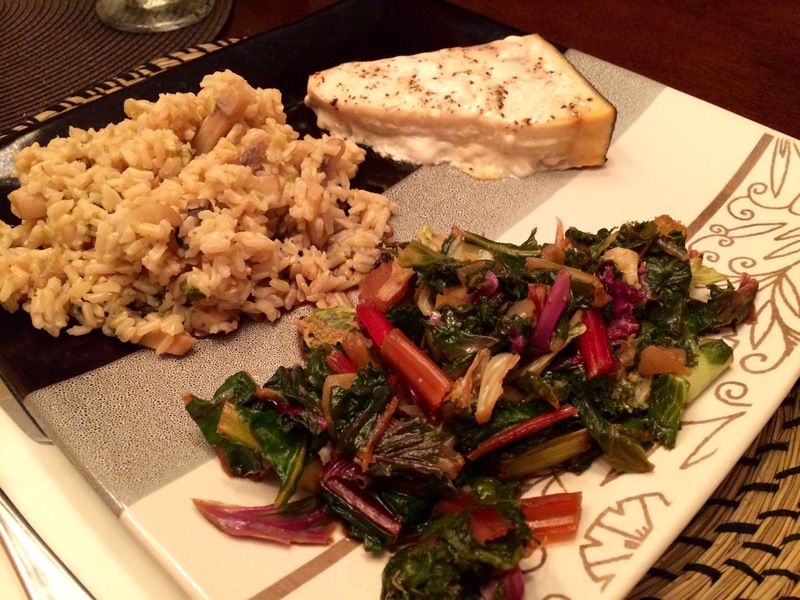 The sides were sauteed kale and swiss chard and a simple rice dish. The swiss chard was sauteed with some garlic and onions, then topped off with a splash of balsamic vinegar before taking it off the heat. The rice was just a long grain brown rice that I cooked up with mushrooms, garlic and green onion. For rice dishes I like to use the method of sauteing the add-in’s first, then adding the rice and liquid and letting it all cook together as it really gives the rice much more flavour. Easy. Everything is very simple to put together and it can all be coordinated quite well to be done all at the same time. Do your rice and let that cook while making your protein. Finally while those are finishing up, do you greens and then serve. 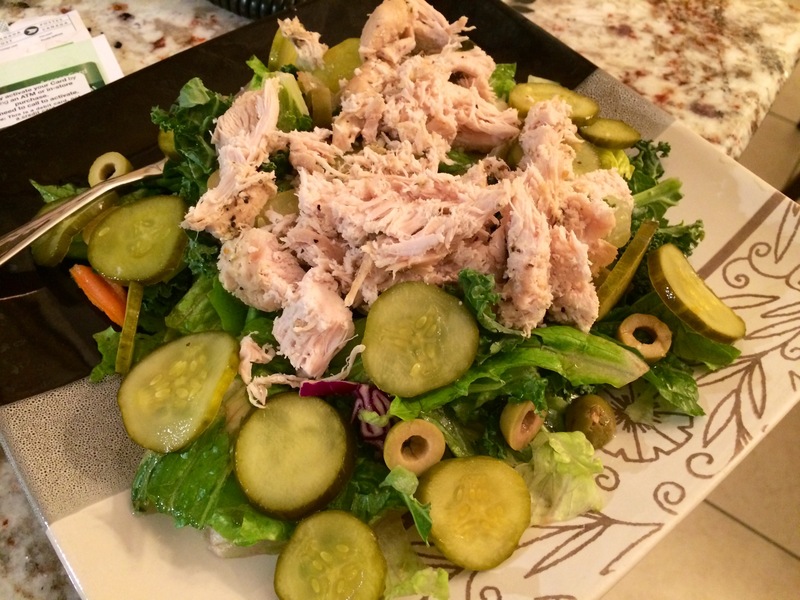 Greens! And they were enjoyed! 😀 Success in my book. Cheap. 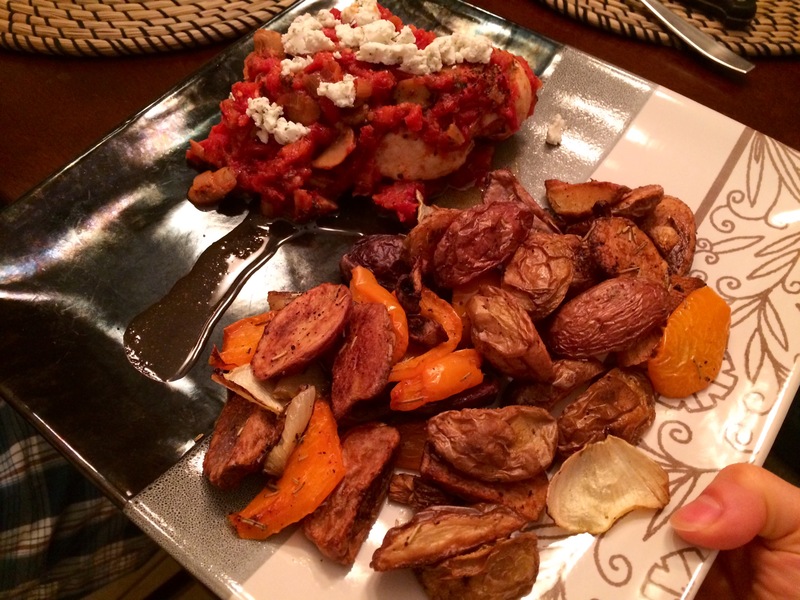 These are all kitchen staples aside from the goat cheese and roasted red peppers. Turkey is cheaper than chicken, and scallopini cuts are cheaper then tenderloins or breasts. The rice can be made with really anything you have on hand and a whole bag of greens, or a bunch if you don’t care about chopping them all up, costs no more than 2 bucks. If you’re interested, here is the greens mix I used. Such an awesome blend and super convenient. I also appreciate the fact that they have big chunks of the stems left in there too as I really like the crunch they add to my cooked greens. I also love the chopped kale one. 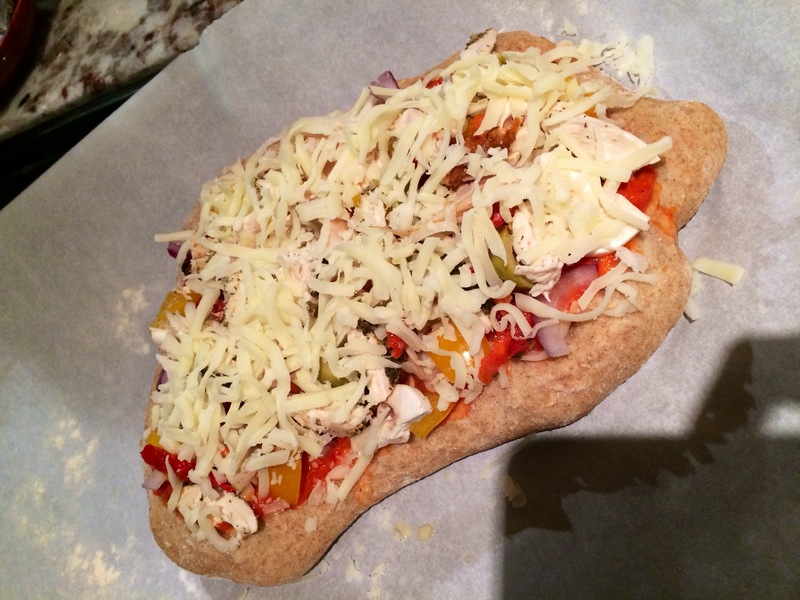 So homemade pizza…well we used a store bought whole wheat dough cuz I’m a cheater…it was. The dough really puffed up which never happened before when I make this in the past, so this was super dough apparently. Oh well, my parents enjoyed the fluff factor of the crust. Anyways, the picture above is after the first bake. What I do is take the dough and stretch it out in the pizzas and then let it rest before pre-cooking it (at 400-425 degrees until it’s your preferred doneness. You could probably go crunchier but when I saw the bubbles that were my pizzas in the oven, I kinda freaked and took them out…then stabbed them with a toothpick to deflate them to the shape you see) before adding the toppings. The pre-cook gives it a bit of a crunch so that the sauce doesn’t make it soggy. Then it’s time to add your sauce. For me, and now my parents, pesto >>>>> tomato or pizza sauce. I’m super sad that I have forgotten where I found this recipe from but this is the most amazing pizza pesto sauce ever and you really must try it. It would also make for a great sauce for chicken or a pasta dish! If anyone finds the original author of this recipe or one very similar please let me know as I’m not looking to be stealin or anything. I give credit where it’s due and this sauce is amazing with a capital A! 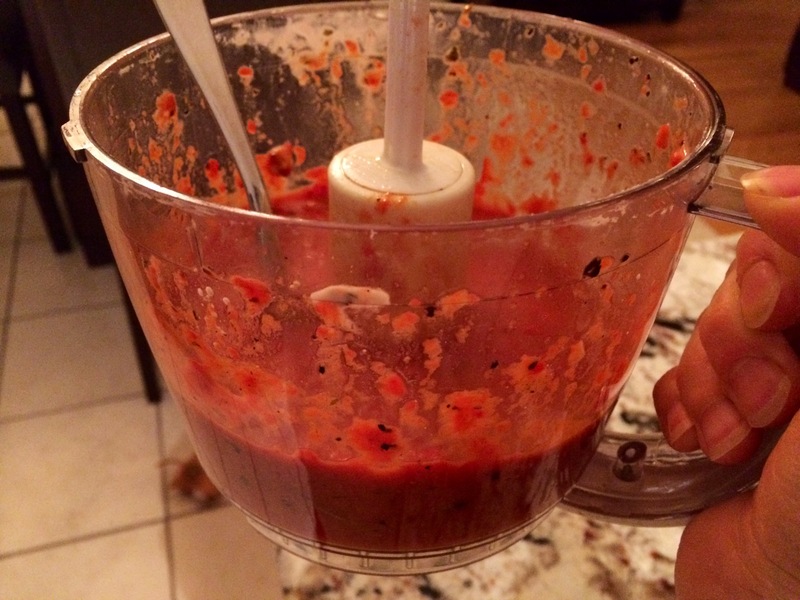 1 jar (500ml) of roasted red peppers in water + the garlic that is in it. 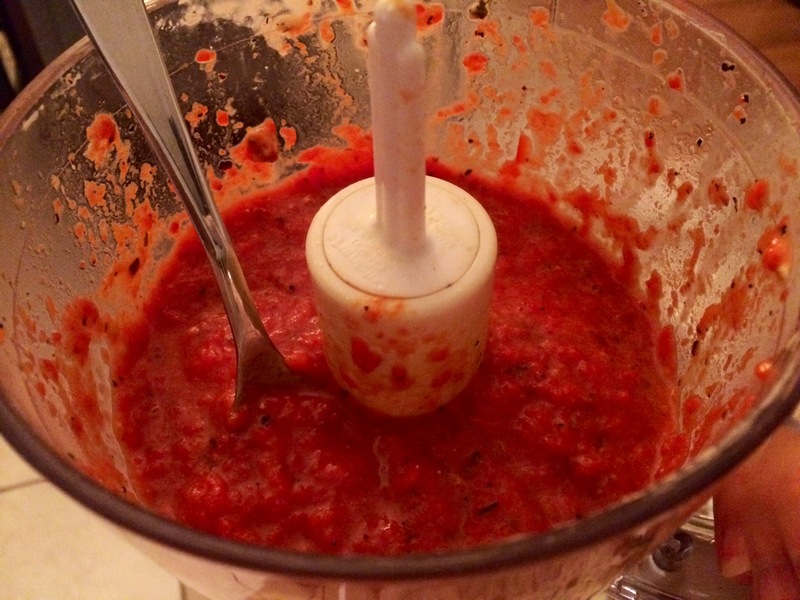 If there is not garlic, add a clover or two to your blender. Try to drain as much of the liquid as possible so that the sauce isn’t super runny. Chili flakes for an optional kick. Blend all of that up for your sauce. You should have enough to cover an entire standard sized ball of dough (unless you like drowned pizza) and maybe a bit extra. So spread that on your pizza, then add a bit of your cheese of choice (I used Blue Menu part-skim mozzarella), then the toppings, then the final round of cheese. For the toppings, my Mom got her favourites of mushrooms, sundried tomatoes, chicken, olives and pineapple. My Dad got all the same things as my Mom (sans pineapple and only a few olives) plus sweet bell pepper and onion. Throw the pizzas back in the oven and let the cheese melt and brown up to your liking then dig in. For dairy allergies you can try goat cheese if you can tolerate it OR just have it without the cheese. There are dairy free cheeses out there like Daiya, but I don’t recommend those simply because….well, read the ingredients label and come back to me. 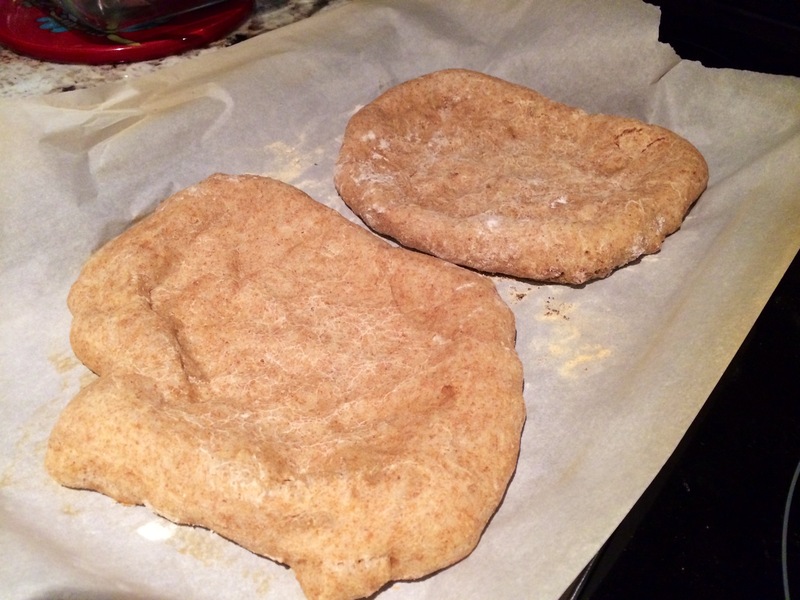 You can make a cauliflower dough (I have even seen spaghetti squash ones). The issue here is for those with milk allergies as I have found that many of the ones that appear to hold together require a heavy hand of cheese. You can try a meatza. The meatza is something I have wanted to try actually but haven’t yet. It’s basically using ground meat with a binding agents (I would probably use some egg whites with my gluten free oats OR coconut flour and flax meal) as your base then you load your toppings on top. 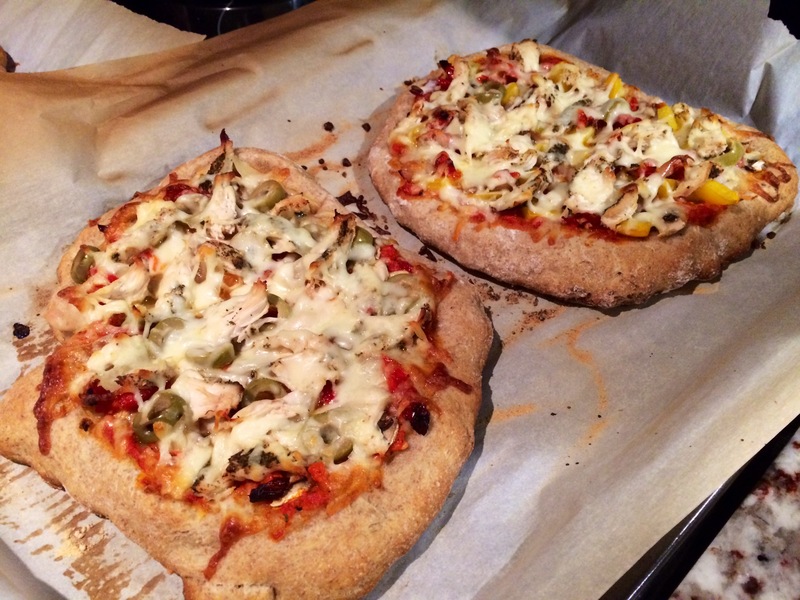 No matter how you make your own pizza, they are going to be super fun and interactive to do. PLUS it will obviously be something you love because you are adding all of your favourite things. ONE TIDBIT! Use parchment paper and some flour of some kind or they will stick and you will be sad. This one is a no-show because I met up with my friend Shady that day, so my parents told me they would just make their meat tourtiere instead. My Mom did get to try a piece of my Chilean sea bass that I picked up at Whole Foods while I was there. She didn’t like the texture. I know who is she?!? That buttery, melt in your mouth texture…I digress. Total debt of the day was about 100 bucks, not too bad considering I haven’t been to a Whole Foods in like 1/2 a year. You see, it’s like food, if you restrict then you are likely to binge. Keep me from Whole Foods for longer than a few weeks, and my debit card will be on firrrraaahh. 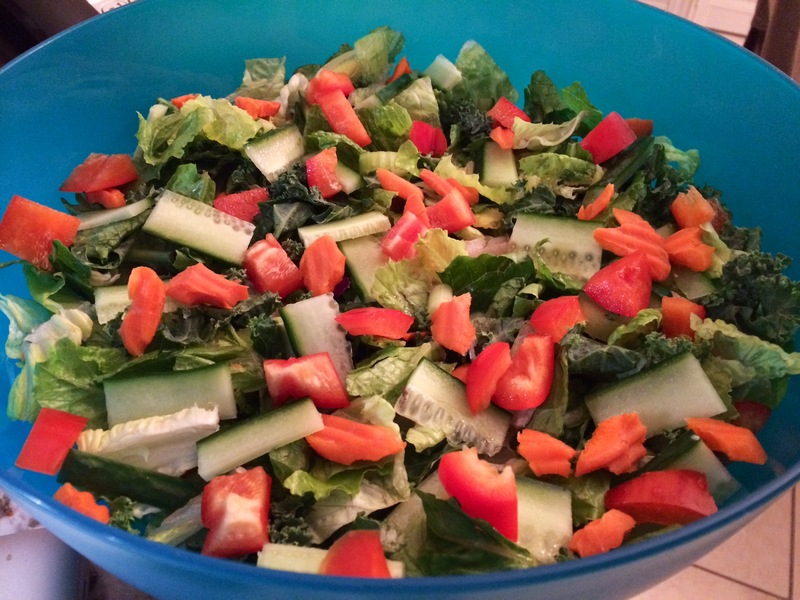 Thursday night apparently is a salad with chicken strips + Family Feud night, so I couldn’t mess around with that. Instead, I made them a nice big salad with a baked turkey breast that was seasoned with Mrs Dash and this lemon garlic dressing stuff that my Mom threw on top. Tip for making super juicy chicken or turkey breasts in the oven: place in a foil pouch with a lil bit of a liquid and your seasoning of choice. Seal up the foil tightly and the steam keeps the meat from getting dry while baking in the oven. So I made it a bit healthier by depriving them of their fried chicken 😀 I win. Oh and I also snuck kale into the mix hehehe. Although, my Dad pointed out that he quite liked the green grassy stuff. Point two for Chessie! My Mom went out for some tapas and drinks with some friends (oh we fancy huh?) so my Dad got his first official #SaladBeast! Of course, my Dad got his own set of toppings as some of my favs are things he turns his nose up at. He’s a squash hater...but he’s never really tried it. Again, where did I come from? Dad: Raw carrots, roasted potatoes (seasoned with garlic, rosemary, pepper and olive oil), sundried tomatoes, some roasted asparagus and I snuck in some avocado without telling him. 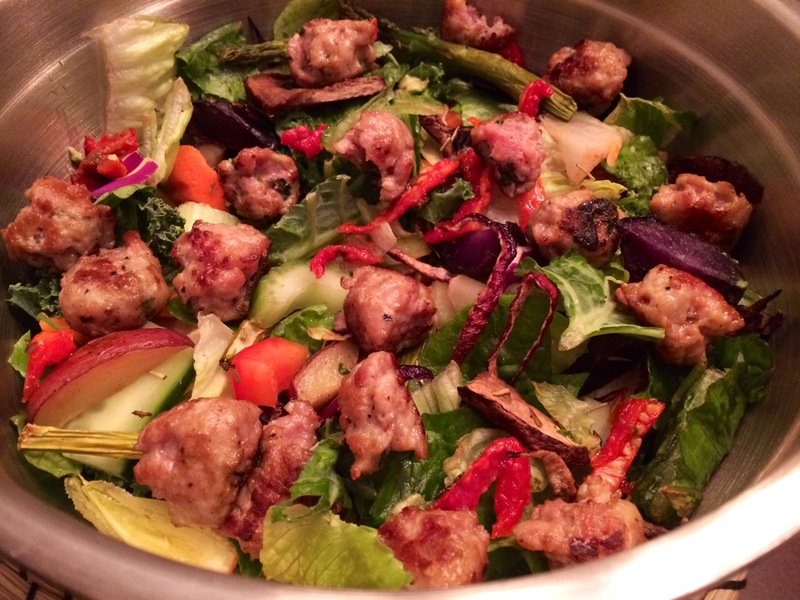 😉 He also got a spinach and feta turkey sausage that I picked him up special from whole foods. Pre-dressing and cheddar cheese that my Dad added in. Me: 1 random fruit (will get to in a second), roasted squash (obviously), and avocado. As for my protein, I used my leftover baked chicken breast seasoned with Mrs Dash tomato and basil salt free seasoning. OMG guys this one is so so good! Now that fruit I mentioned…. 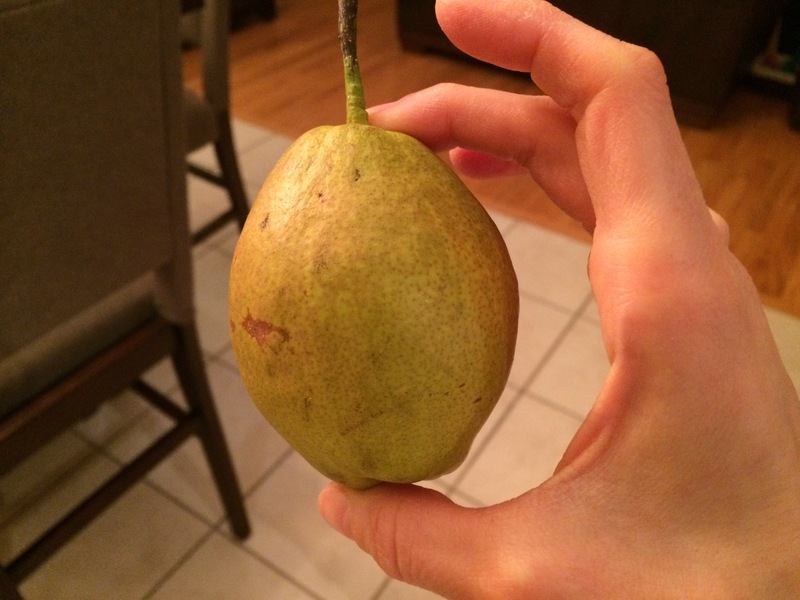 This is the most fragrant pear I have ever had. It’s actually called a fragrant pear no joke. All the grocery store tag gave me was that it was from China, so I had to look it up because I was curious. I didn’t find much, but basically these pears are grown in a certain small area in China along Silk Road and boost a sweet, honey-like fragrance. They are considered to be some of the finest pears in the country and although they have been cultivated for 13000 years, they have only left the country and shown up in America as of a few years ago. You can read more about them here if you’re interested. You will have to wait to figure out if the pear is any good because I moved my saladbeast to Sunday night cuz my tummy was feeling some kinda way due to…well ladies will understand, so I didn’t feel like a salad baby bloat tonight. Well guys, that was the first full week of my parents eats. I hope they gave you some ideas. Favourite thing to make with chicken? Do you like fruit in salads? I have only recently got over my fear of fruit elsewhere in my day other than around workout time and I have to say that I really do enjoy it when I have my saladbeasts BUT it cannot be a mushy fruit so no berries and such for me. Categories: Challenge, Personal, Recipe, Tips and Tricks | Tags: Chicken Recipes, Dinner Ideas, Easy Recipes, Food Inspiration, Healthy Eating, Healthy Food, Healthy Food Inspiration, Homemade Food, Homemade Pizza, Meal Challenge, Meal Ideas, Nutrition, Pesto, Recipes, SaladBeast, Weekly Eats, What My Parents Ate | Permalink.